Winter is hard on everyone, not just those over a certain age; it can be socially isolating, physically back-breaking and emotionally draining. But for those folks who are over the age of 55, winter can be flat-out dangerous. Invest in A Medical Alert Device. The technology behind medical alert devices has come a long way in the past few decades. If you are still pretty active, you should consider investing in a mobile alert system that can be with you both inside and outside of the house, so that you have access to help no matter where and accident might occur. It can provide you with peace of mind and, in certain instances, literally save your life. Pay Attention. This is an important one, which people of all ages often ignore. Look down at your feet while you are walking to ensure that you can safely navigate around icy patches on sidewalks. Don’t distract yourself by talking on the phone, or even talking to someone you might be out with, because that can take you out of the zone of watching where you are going. This is an excellent all-weather tip, as it’s easy to take a fall while distracted any time of year, in any climate. Pick Your Feet Up. Shuffling your feet as you walk plays a big role in whether or not you might stumble. 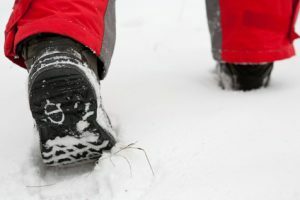 This is also an all-weather tip, as shuffling your feet, whether on snow or uneven pavement, can be a recipe for disaster. If you feel as though you might have trouble picking your feet up off the ground when you walk, it might be time to have a more in-depth chat with your physician. Winter, Spring, Summer or Fall, these tips can really aid in fall prevention, no matter what the weather report is calling for. It can be difficult to accept that it’s time for you to make these small changes to your life, but aging proactively can be much more rewarding than aging reactively. If you’ve been injured in a slip and fall accident, we can help.